One of my favorite gravies to go with rice. My Nagerkoil aunt makes awesome pulicurry. She makes atleast once in a week with different vegetable each time(Cucumber,Drumstick,Raw Jackfruit,Okra...). She prefers to make it in a clay pot and with the home grown tender coconut. I enjoyed this dish almost every week during my stay at my Aunt's place when I did my Under Grad. 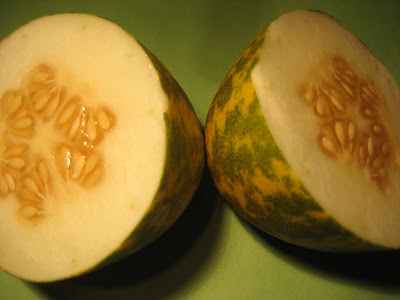 Last week I bought yellow cucumber from Indian Grocery. I wanted to make two dishes with that. I halved the cucumber and made Pulicurry with one half and cucumber pickle with the other. Peel, seed and cut the cucumber lengthwise. Take a cup of water in a pan and boil the cucumber pieces with little salt. Soak the tamrind in little water and extract the pulp. Add the pulp to the cucumber and let it cook till the cucumber becomes soft. 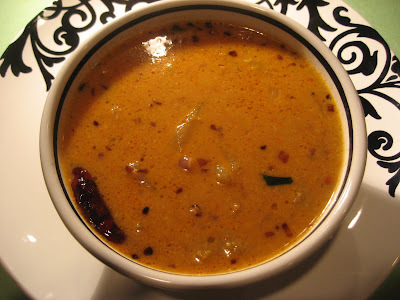 Grind coconut, cumin seeds, red chilies, turmeric powder, shallots & garlic to a fine paste. Add Shallot and Garlic to the final pulse. Add the ground paste and a cup of water to the vegetable and let it cook for 5 more mts. Heat two tablespoons of oil in a pan. Add Mustard seeds and fenugreek to the pan . Once the seeds start to splutter, add the finely chopped shallots and curry leaves and fry till the shallots become soft and lightly browned. 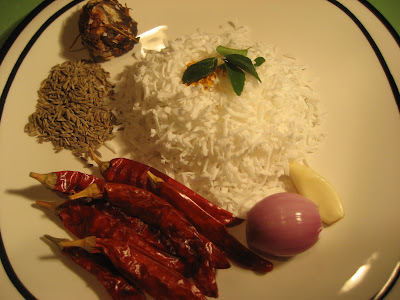 Add crushed vadagams (sun-dried onion and Urad dhal balls) if you don't have shallots. Return this seasoning to the pulicurry . Enjoy this lip smacking gravy with steaming hot rice. A dish that really wakes up your taste buds!